Monday — Friday, 8:00 a.m. — 8:00 p.m.
Take a minute to browse through all of the unforgettable places you can experience on your trip. We're proud of our area and the Historic Smith Hotel Bed and Breakfast tourist sites. The southwest United States is characterized by deserts and mountain ranges forming valleys and basins which, in the right light, are truly spectacular. Photographers spend their daylight hours shooting pictures until they run out of light or space on their cameras. With so many great areas surrounding Smith Hotel, it would take weeks to see them all. Here are a few of our favorites. Zion and Bryce Canyon National Parks are the closest parks to the hotel. Nearly 100% of our guests visit these parks while staying with us. A third park, North Rim Grand Canyon National Park, is only 90 miles away. Bryce Canyon is a beautiful, one-hour drive north that takes you along rivers and between two mountains. Red Rock Canyon sits at the entrance of Bryce, framing its marvelous entrance. The drive on Hwy 12 from Boulder, Utah to Bryce is one of the best drives in the area. Anastasi State Park in Boulder is also well worth seeing and makes for a very manageable day trip. Don't miss the Burr trail for a slot-like canyon drive for cars starting from there. Zion National Park lies 26 minutes to our south and has majestic sandstone peaks signaling its entrance. All visitors agree that this park — with rocks faces of over a thousand feet, tight curved roads, and varied wildlife — is breathtaking. A shuttle system is available to take you up the valley along the river, and many varied hikes will inspire you to stay longer then you had planned. North Rim Grand Canyon National Park is 90 miles to the south on Hwy 89A. 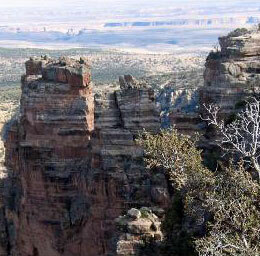 It offers a view of the canyon from a north-to-south vantage point. At 9,000 feet, it remains cooler than the Grand Canyon. The drive into the north rim is well worth the 45-minute excursion. This stunning natural monument sits at our doorstep; the road leading into this two-million-acre area starts at our driveway. Even though the roads are mostly gravel, they are well-maintained. There will be few visitors with you as it is maintained simply to give a wilderness experience. One of the area's best slot canyons is within its borders. Hwy 14, the route to Cedar City, Utah is one of the prettiest drives in our area. Traveling this route takes you over a great set of mountains where you will view huge ponderosa pines, aspen groves, several lakes, and vast lava fields. The views back to Zion are also spectacular as you have a great perspective from 10,000 feet up! Page, Arizona is most definitely a destination worth visiting. After traveling two hours south on Hwy 89, you break over a small ridge to see Lake Powell, formed by the Colorado River. This lake is one of the most spectacular bodies of water in the desert southwest. World-class trout fishing exists at Lee's Ferry near Page on the Colorado River. And don't miss out on Antelope Canyon — the most photographed slot canyon in the area! Staying at the Smith Hotel puts you close to all these major areas and places. We have local knowledge of great little nooks and slots just waiting for the willing explorer. Stay with us today and learn all about our area's popular destinations and hidden gems.